Marma points, often called vital, hidden, or secret points, are found all over the body and are energetically linked to the chakras. When marma points are open, the body is kept fully informed and can easily heal itself. Our postures are graceful, our organs function well, our minds are clear, and we feel a sense of ease and connection. Our skin appears youthful and we have a healthy glow to our being. Marma points work like little light bulbs; turned on by touch to illuminate the face. When they are partly or fully closed, due to mental stress, poor diets , or injury, it can lead to problems of all kinds. For example, our faces may appear strained and dull, we may experience breakouts, and we may comment about feeling disconnected or confused.If you want to go deeper into your self-care routine, you can apply pressure to your marma points. Each point correlates with a particular physical and mental aspect of your mind and body. These points helpus balance our energy, lymphatic, nervous, and circulatory system. According to Ayurveda, regular massage balances Vata dosha and makes the skin firm and smooth. According to Sushruta, it balances Vata and Kapha, enhances the complexion and slows down the aging process (Jarahar). 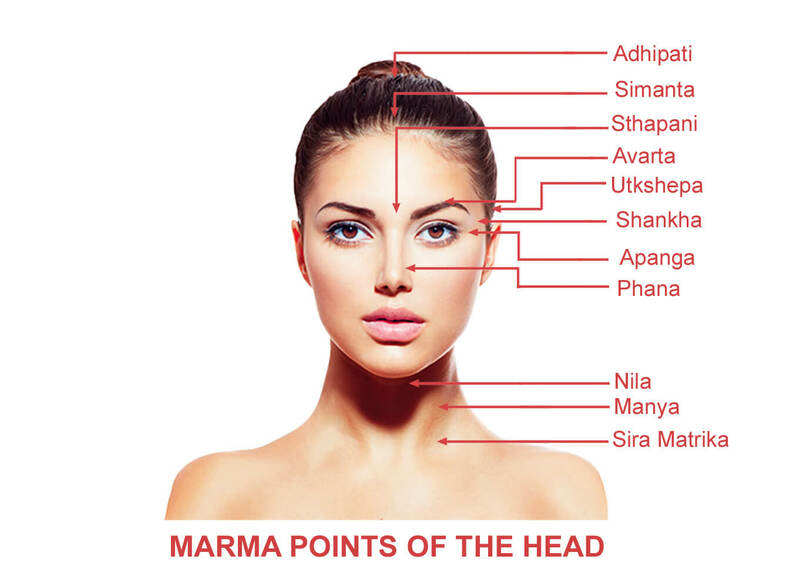 We know that marma points are the energy points which play an important role of dynamic center, regulates the body and keeps it in harmony and a balanced state. Therefore massage of these points is considered to enhance the effectiveness of this procedure for general wellbeing.This therapeutic treatment is not about vanity. Real self-care is about nourishment on the levels of understanding, compassion, and balance for all three bodies: physical, mental, and emotional. Enjoy your beautiful self and try these suggestions for inner and outer beauty. Marma points make relation with various internal organs, doshas and channels (srotas) via their inherent channels through which vital force of life flows (pranic channels). By stimulating or massaging these marma points, functions of connecting organs can also be improved. 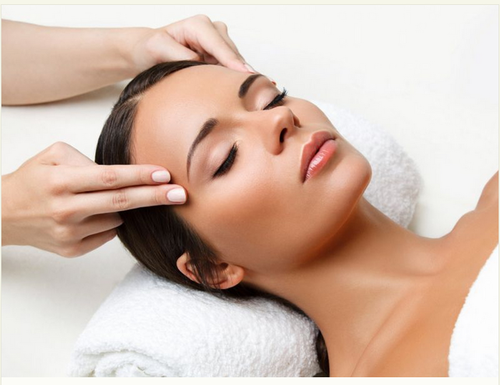 Many therapists use these points both for curing as well as preventing any health disorders.Facial massage on these points with specific types of herbal, aromatic or essential oils can be used as rejuvenation therapy as well as to energize the body to relieve occupational illness and stress related diseases. Regular facial massage using the marma points of the face can be a truly holistic treatment to care for face, mind, body and soul. Relieves stress and tension, which in turn may reduce the appearance of fine lines. Increases circulation; more blood in the skin means more nutrients being delivered, and consequently healthier skin cells that hold their tone and vitality. Increases lymph flow for glowing skin. Increases prana (vital energy) that keeps the skin looking fresh and alive. Promotes greater absorption of oils or creams that nourish the skin cells and skin barrier, improving skin hydration. Helps you attain quality sleep that restores the body and boosts immune response. Calms nerves and reduces fatigue.